My husband has developed what can only be described as a sixth sense for mushrooms. Somehow, he knows exactly when and where to look. He said it was time to go hunting. But the weather seemed too warm, and the fog hadn't set in yet. I was certain that the sun was too direct, I was convinced that the ground was too dry. I questioned him. I second-guessed him. I doubted him. Until he led me right to them. The first chanterelles of the season. This time, I was all too happy to admit he was right. 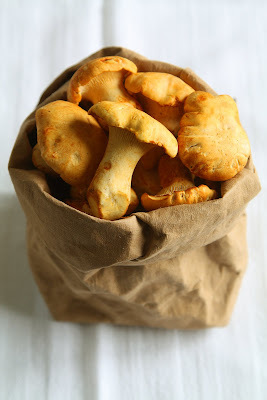 Despite my husband's keen mushroom hunting intuition, chanterelles are still a rare treat for us. So whenever we find some, we pull out all the stops and make something very special with them. This time it was delicate ravioli. But before I get to the recipe, here's my interview on the Lonely Gourmet in case you missed it. We chatted about my cookbook and the finer points of searing. So much fun! Heat a large, heavy sauté pan over medium-high heat until hot but not smoking. Add the oil and swirl to coat the bottom of the pan. Add the chanterelles and sauté for 6 to 7 minutes, or until tender. Add the garlic and sauté for another 1 to 2 minutes, or until fragrant. Let cool. Combine the chanterelles, ricotta, Parmegiano, egg, and nutmeg in a food processor and pulse until smooth. Season to taste with salt and pepper. 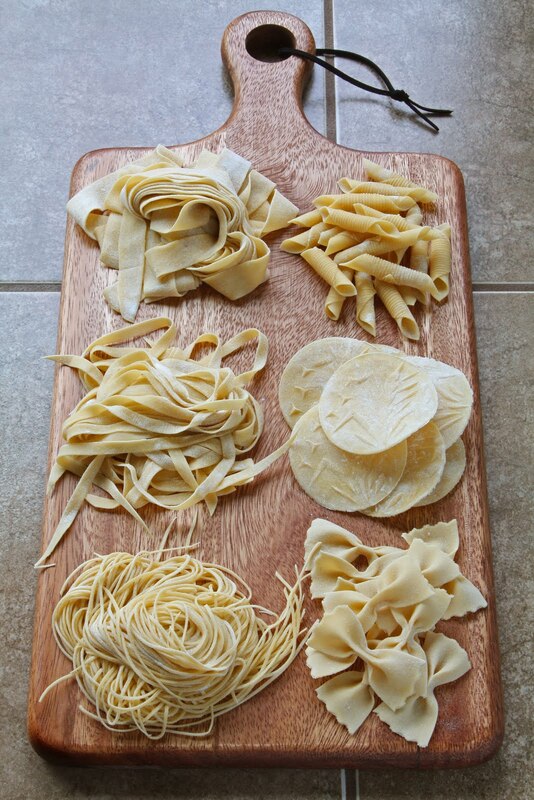 Sheet and form just 1 or 2 pieces of the pasta dough at a time according to the recipe, sheeting it until the second-to-last narrowest setting of the rollers and using 1 teaspoon of filling per ravioli. 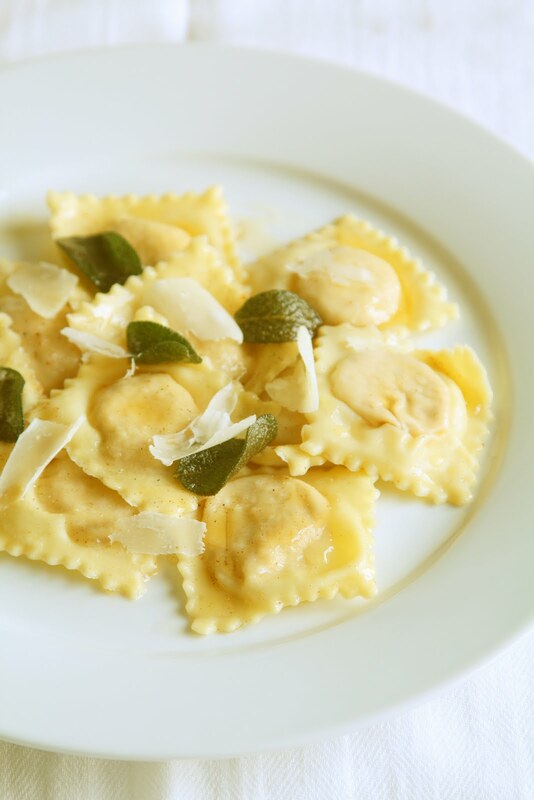 As you work, arrange the ravioli in a single layer on lightly floured parchment-lined baking trays. Heat a small, heavy saucepan over medium heat until very hot but not smoking. Add the butter and cook, stirring constantly, for 5 to 6 minutes, or until browned. Add the sage and a generous pinch of pepper and cook, stirring constantly, for about 1 minute, or until the sage is crisp. Remove the pan from the heat and dip the bottom into an ice water bath for a second or two. Meanwhile, cook the ravioli in 2 or 3 batches in a large pot of boiling, salted water, stirring occasionally, for 3 to 4 minutes, or until they are al dente. When the ravioli are al dente, using a wire skimmer, transfer them from the pot to a large bowl, drizzle with a bit of the brown butter, and gently toss to coat. Arrange on individual plates, drizzle with the remaining brown butter, top with plenty of Parmegiano, and serve immediately. 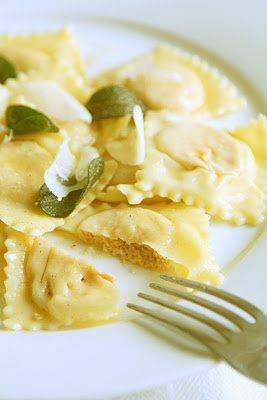 Makes approximately 7 dozen 1 ½-inch ravioli, serving 6 as a main course. This was the ravioli plaque used. Speed the cooking time by using two large pots of water for boiling the ravioli. Uncooked ravioli may be frozen in a single layer on a parchment-lined baking tray and transferred to a zip-top bag when frozen solid. Ravioli keep for several weeks frozen. Add them to boiling water while still frozen—there's no need to thaw them, just increase their cooking time by a couple of minutes. Keep scraps of dough leftover from cutting ravioli to put in soup. Macaroni and cheese used to be a tangle of steaming spaghetti with butter and cheese melting into it and a generous grinding of black pepper on top. All gooey and stringy, that's how my mom would make it when I was a kid. She cooked the pasta beyond al dente until it was tender, and she must've used cheddar or mozzarella or possibly Monterey jack but I can't remember for sure. She was never one for sauces. Then one day, I had dinner at a friend's house and discovered the joy of macaroni bathed in a cheese sauce. It came in the form of Velveeta Shells and Cheese. I know it seems odd to give Kraft credit for one of my formative food experiences, but I still remember it as the moment that I, an impressionable teenager, tasted a creamy cheese sauce for the very first time. 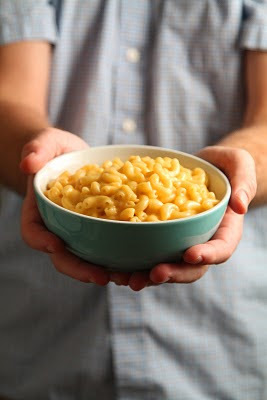 So now when I close my eyes and imagine the perfect comfort food macaroni and cheese, the dish the kid in me idealizes, I think of a velvety cheese sauce flavored boldly with real cheddar cheese. And I imagine an effortless recipe that is a cinch to quickly throw together on a whim and can be made with ingredients that are always on hand. It's elusive, this macaroni and cheese I dream of. For or a long time I thought it didn't exist at all. Most versions that I have had…that I have myself made don't live up. Macaroni and cheese made with roux-based white sauce doesn't quite do it for me because it tastes more like the white sauce than the cheese, no matter how expert the execution and fine the ingredients. It doesn't have the right creaminess either. Besides all that, why should a dish so humble require at least 45 minutes, the use of both the stovetop and the oven, and the dirtying of two pots, a colander, and a baking dish? Boxed macaroni and cheese and deli versions don't even come close, since they employ processed cheese and various neon orange powders in lieu of real cheese. Researching stovetop recipes proved fruitless, as most called for evaporated milk, which seemed gross, or thickening the sauce with egg, which seemed out of place, or both. I got to thinking…Why drain the cooked pasta, losing all its precious starch just to use a different starch to thicken the sauce? Why not take advantage of the pasta's own starch for thickening the sauce? And why not cook macaroni and cheese more like it was risotto, adding only as much liquid as the pasta will absorb? I literally ran into the kitchen and started cooking. It was nothing less than a eureka moment! Thus, Lucy's Ultimate Mac & Cheese was born. I must say, even if it borders on bragging, that I'm really proud of this recipe. The texture and flavor are exactly what I'd been looking for ever since I was a kid. It requires little more time or effort than the packaged stuff, and the only cleanup is one pot and one spoon. It's a stovetop recipe, so you can make it even in the summertime when it's too hot to turn on the oven. Oh, and leftovers, should there be any, reheat nicely in the microwave. I think you'll agree it really is the ultimate. 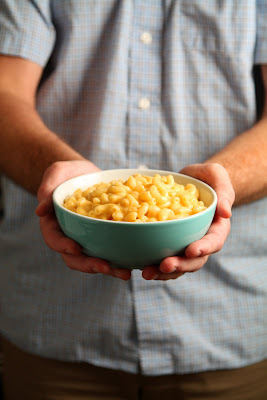 Combine the macaroni, milk, butter, mustard, granulated garlic, cayenne, and 3 cups of water in a medium, heavy pot. Bring to a boil and simmer, stirring constantly and adding more water as necessary any time the macaroni looks dry, for 7 to 8 minutes, or until the macaroni is just tender. Remove from the heat and stir in the cheddar, Worcestershire, and Tabasco. Season to taste with salt and pepper and serve immediately. Serves 4 to 6. The trick to this recipe's seductive creaminess is constant stirring from the time the pot is put on the heat and making sure there's enough water in the pot. There will be plenty of liquid in the beginning. When the mixture comes to a boil, the starch from the pasta will make it thicken, creating a creamy sauce. The sauce will reduce and continue to thicken as it simmers and as the pasta absorbs water. Adjust the heat so that it cooks at a lively bubble. Too slow, and the pasta will take forever to cook. Boil it too fast, and it'll be hard to monitor the level of the liquid. Toward the end of the cooking time, there should still be enough sauce in the pot to just cover the macaroni—if not, or if you like it creamier still, add more water a little at a time, keeping in mind that the cheese will thicken the sauce considerably. It's best to incorporate the cheese off the heat. Do not boil the mixture once the cheddar has been added, or it will have a grainy texture. And speaking of cheddar, why stop at 12 ounces when you can add a whole pound? Or mix it up—consider substituting a portion of the cheddar with provolone, mozzarella, and/or Parmegiano for a different flavor and some stringy action. Top with toasted buttered breadcrumbs or some such crunchy thing if you must, but I prefer to appreciate the creaminess unspoiled.